I needed to just make a page. I hadn’t done it in a while. I wanted to capture the moment. I wanted to capture my mood. A few incidents have just been circling and sometimes recording it, & getting it out seems to offer clarity in some way. Or maybe validation? 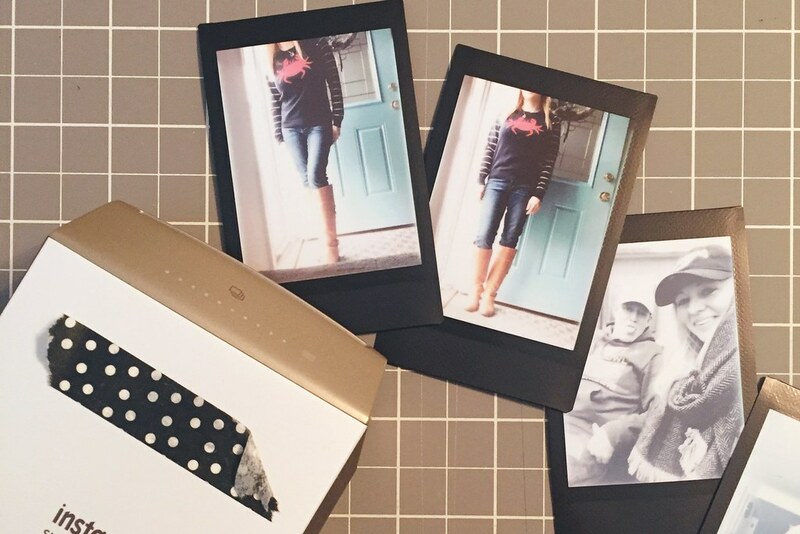 I needed to get some photos printed on my Instax with the black border film that was in there, so that I could change it for some other photos I wanted to print. So I printed these 2 photos from capturing my crab sweater, which also coincided with a Instagram post a couple weeks ago. I just wanted to make and not think too much. 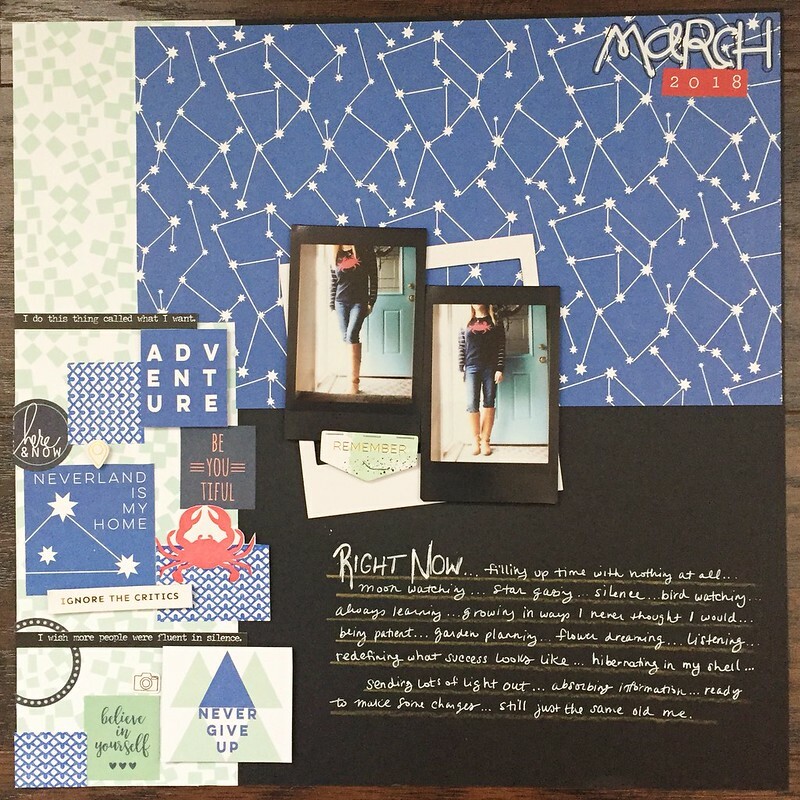 I used paper from Pinkfresh Studio Dream On collection and elements from their Indigo Hill collection, I received in a warehouse box last year. 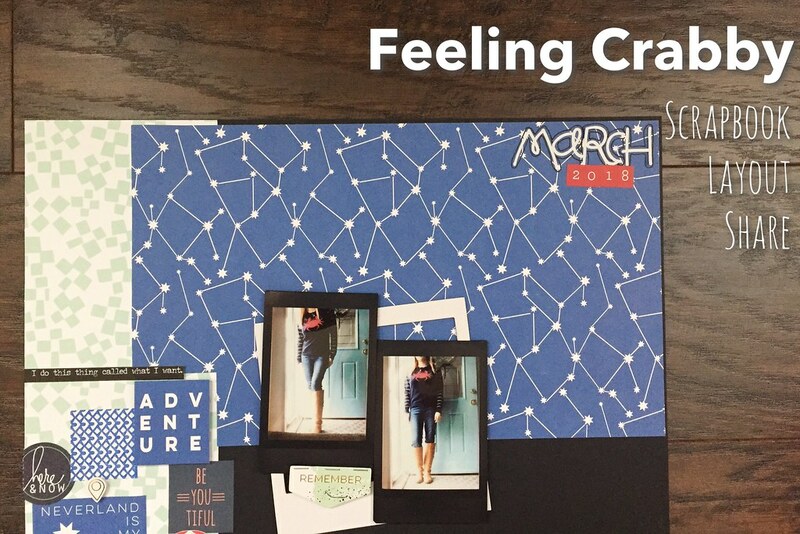 I also wanted to incorporate the new Tim Holtz Snarky Small Talk stickers. I also used some stickers from Simple Stories Carpe Diem Posh line. The cute little crab is actually from a stationery pad my cousin gifted to me. If you follow me at all, you may know about my quest to understand my journey more, which deals with a lot of inward soul searching, in true fashion of a Cancer or crab, water sign, guided by the moon. I let the colors of my sweater guide me. 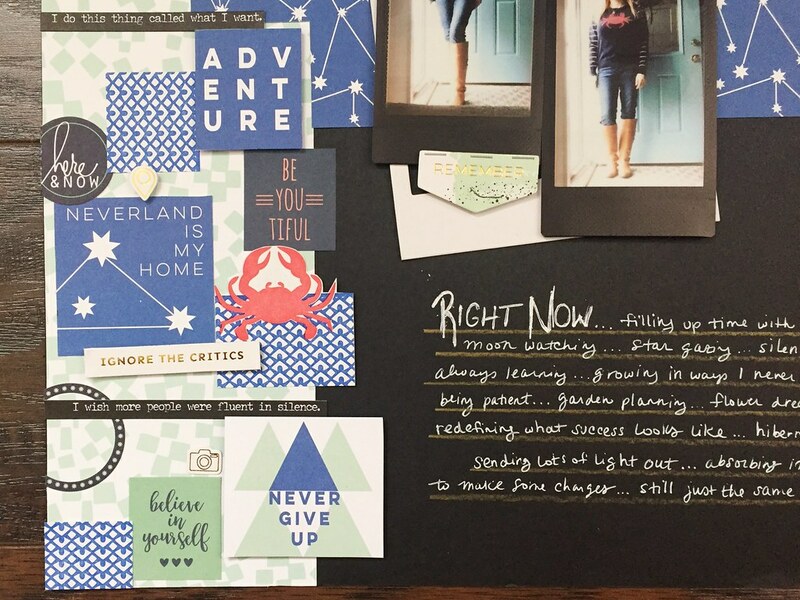 Nautical colors are always a favorite, but I liked that this was not a layout from the nautical season so much. Thinking about these collections in different ways. 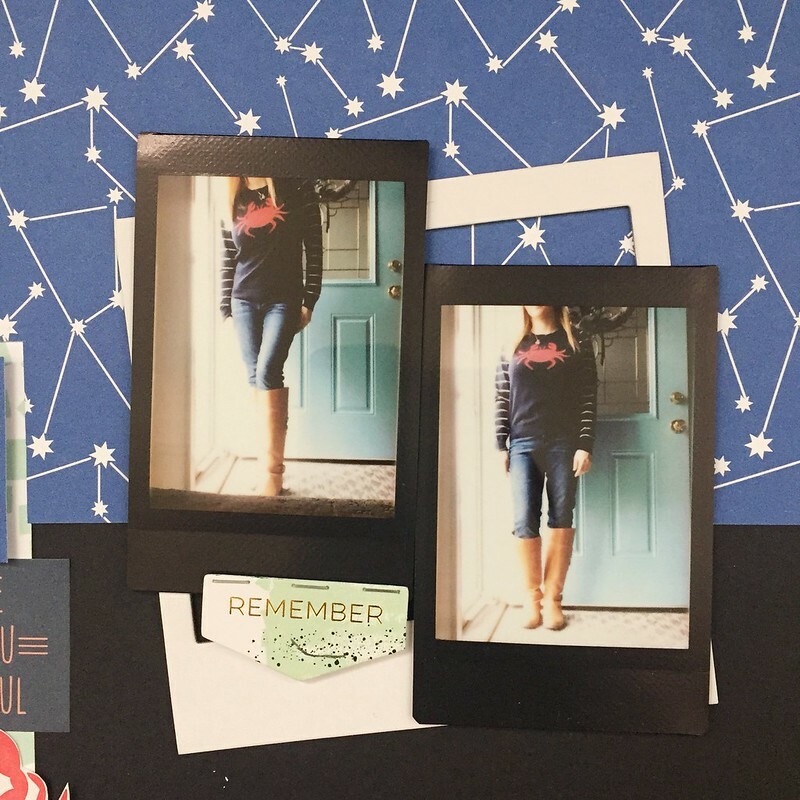 I’ve been challenging myself to use older supplies, so pulled out the polaroid border frame and arranged it under the pop-dotted Instax photos. I knew the most important part was getting some journaling down and left a space at the bottom for some quick notes. 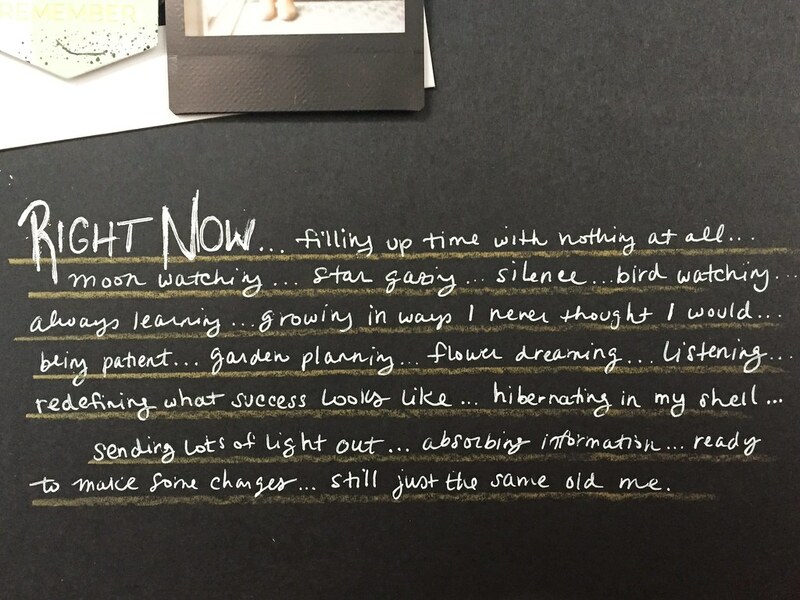 These sentence fragments are probably my favorite way to record journaling. Just how my monkey mind thinks sometimes, in bits & pieces. I used a metallic pencil to quickly sketch some lines as a guide for the journaling. I went to use my Signo white roller ball pen, but it was almost out of ink, so I switched to the Sakura gelly roll. This one also wasn’t flowing, but got it to work. I suspect this incredibly dry air is part of that. For the date title, I used some older alpha stickers. The white did not show up as well as I wanted with the pattern paper, so I outlined it with black pen to stand out a bit more. I like how the layout finally came together. Sometimes I’m not sure as I’m going along, but I was determined to not get held up too much. I actually finished it rather quickly in comparison to others. 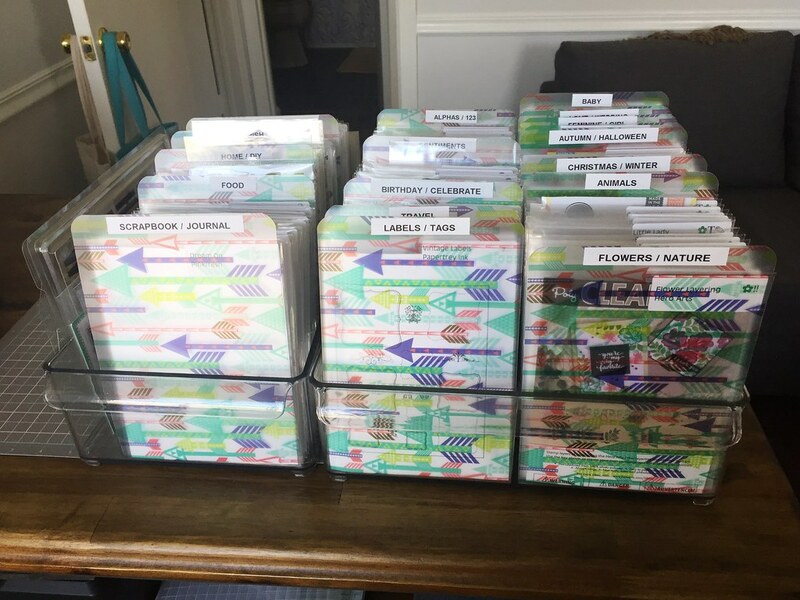 The organization of my clear stamp collection has been a project a few years in the making. I’ve intended a certain outcome for quite some time and keep working on it little by little. I think now is the time to finish it up. After seeing Jennifer McGuire‘s system a few years back I decided to use the Avery Elle storage pockets and purchased them about 3 years ago. I never got around to setting it up until last year when I was refreshing my studio. Most of my stamp sets were from Papertrey Ink and stored in the CD cases. This worked fine for me, but as I’ve collected other manufacturers, I want one place to store them and less of a footprint than the CD cases took. So I decided on the Avery Elle pockets and Fridge Binz for storage. I purchased badge holders to place the stamps on and slide into the pockets. I wanted something clear and sturdy, the idea came to me when I was sorting through some memorabilia and came across large badge holders from a concert. I ordered a large amount through Amazon here. I know there is a lot of info about different type of acrylics and polymer and what is “safe” to store stamps on, etc. I am not particularly concerned about my stamps lasting forever, so it is working for now and I have not had any melting or warping issues. 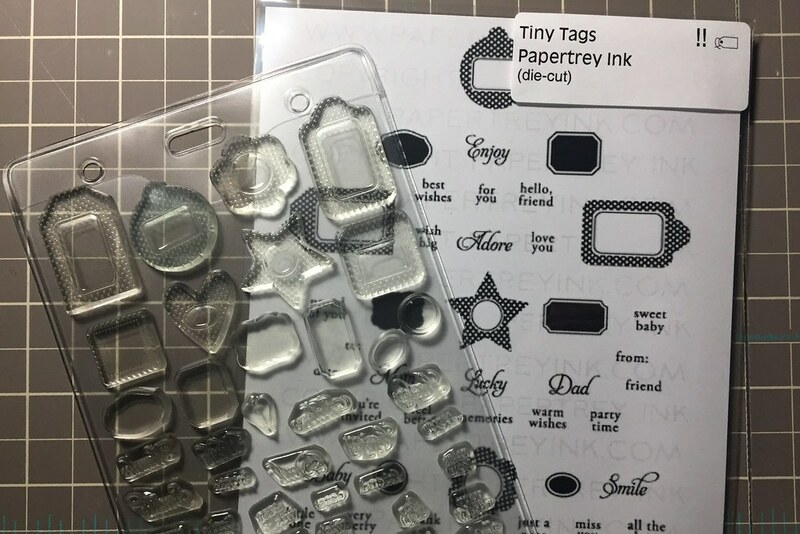 One of the challenges for me with stamping/cardmaking is I can never remember what sentiments I have and where to find them. I have a lot of stamp sets that have multiple purpose sentiments. So I developed a symbol system using Web Dings in word software and set up labels to identify the stamp set. On the label is the name of the set and the manufacturer. 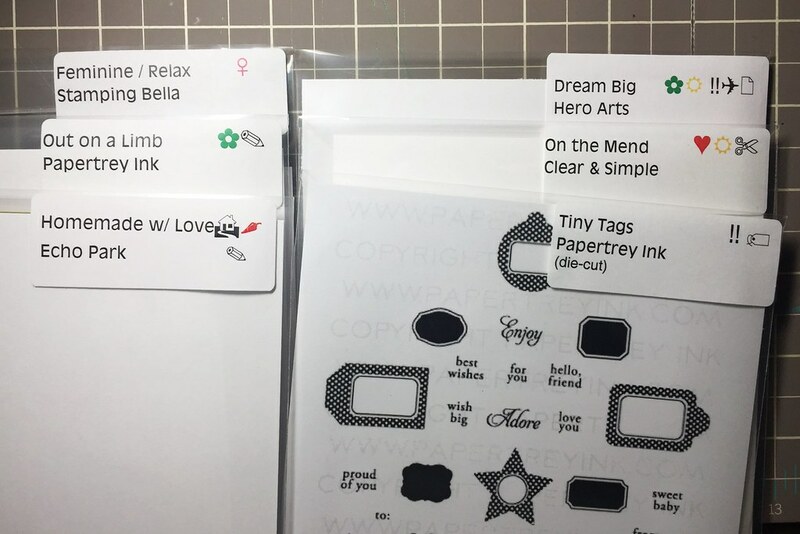 Then there are symbols included on the label that identify types of sentiments or graphics included in the set. 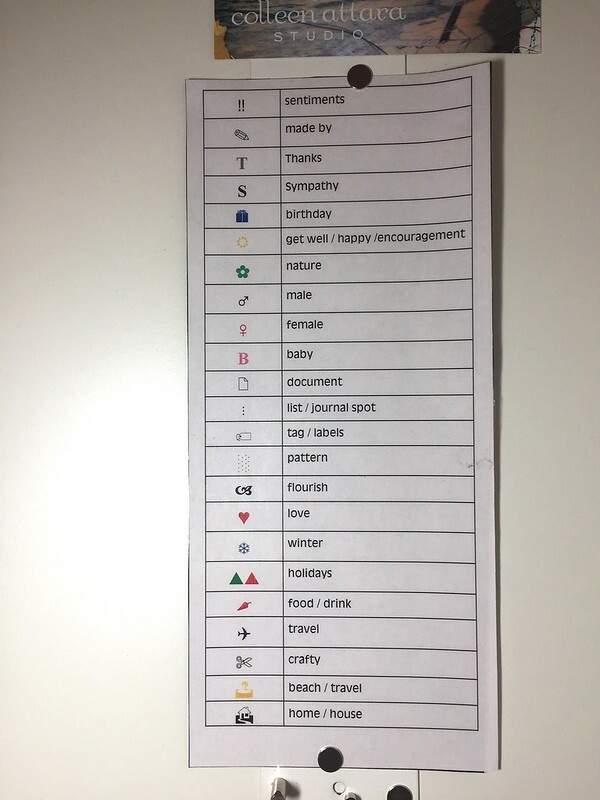 This has helped me immensely because I can flip through quickly and recognize what sets have a sympathy sentiment or some type of encouraging sentiment. After getting all the sets labeled, it was time to decide how to sort them. 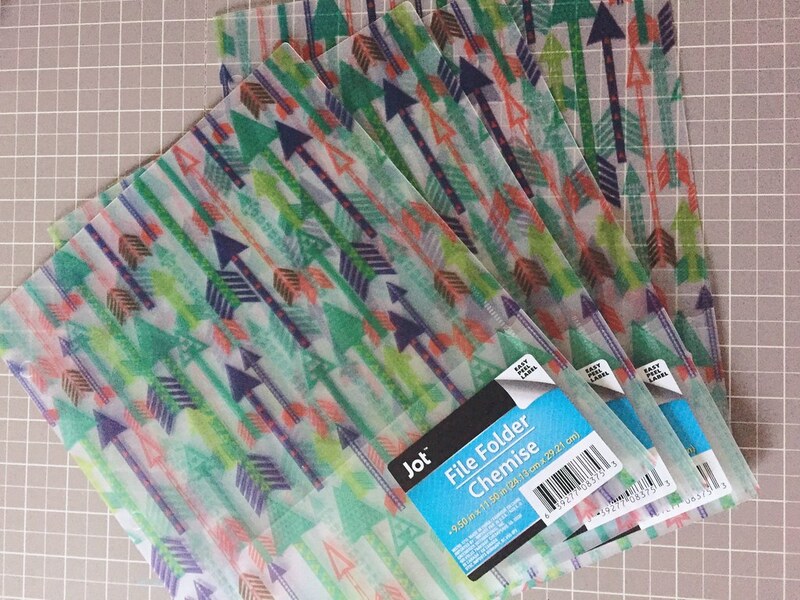 I purchased plastic folders from the Dollar Tree (they have a few different designs) and cut them into 4 pieces to use as dividers. 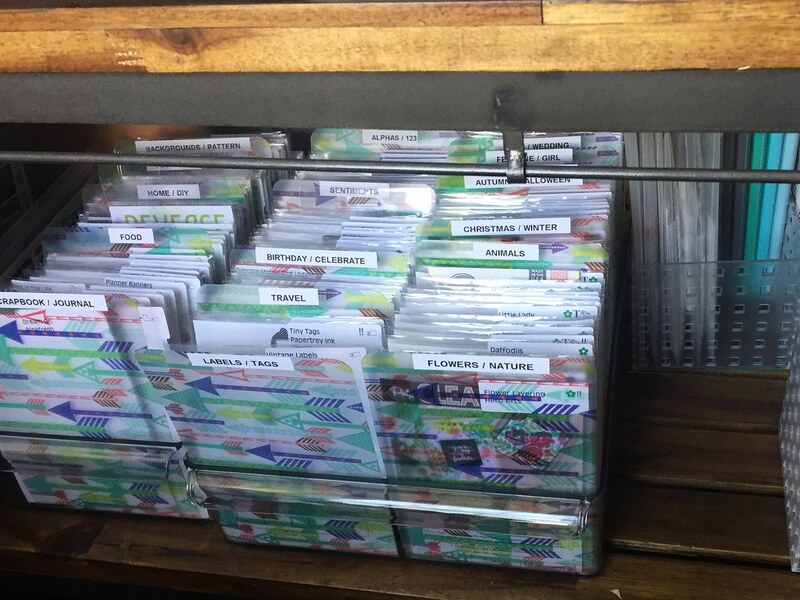 I rounded the corners at the top and used my Dymo LetraTag labelmaker to add labels to the dividers. It may seem like a lot, but I basically just started organically making piles of stamp collections and then decided on the categories. So far this system has worked well for me. 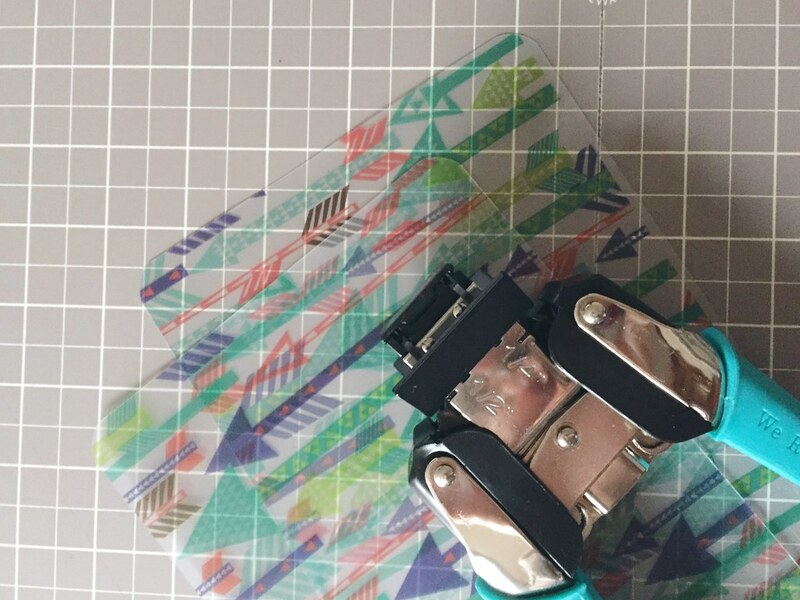 The bins with my stamp sets sit on the bottom of my cart facing the space where I primarily stand to create. Due to all the clear components and labeling, everything is easy to spot, and I feel like I’m using more stamps now that I can find them easier. I’ve spent the last couple weeks enjoying a slower pace. Practicing silence. The silence I crave during busy times like the holiday season. I have a few rituals at the start of a calendar new year to sort of reset a bit. First I sign off of social media for a few weeks, which I’m only actively on Instagram, so not that difficult. I get back to organizing my studio, get old projects wrapped up and line up new ones. I tend to get back to blogging, or more importantly, writing, a thing I love so much but have trouble making time for. And catching up on a lot of reading, or in my case lately listening to audiobooks. I’ve already completed 4 titles this year. I enjoy this slower time to get back to my creativity and rest. The rest helps with the creativity. As much as I am a summer child, I sort of enjoy the quiet, slower pace the winter brings. I’ve had a few days where all I could do was sit under a blanket with the wood burning fireplace roaring away. And I find it’s exactly what I need. As in yoga, honor the body, also honor the mind. Honor the being. Be present and feel what is needed in that moment. For the past 5 years I’ve downloaded and used Susannah Conway’s workbook Unravel. It’s a great way to look back on the past year and make some assessments, as well as ponder the next year to come. I often think about how the new year falls in the northern hemisphere, as we are in winter so there’s more indoor introspection going on. I wonder how different it must be for our friends to the south. 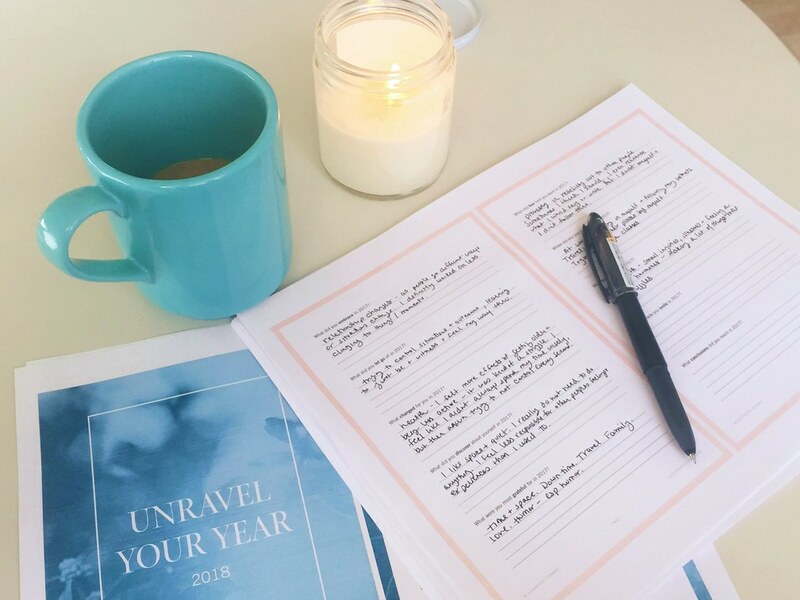 I have a ritual of not looking back at the prior year’s Unravel until I’ve filled out the current one, as to not be influenced by my previous thoughts/plans/ideas. In retrospect of 2017, there were a few things I didn’t get to and a few tasks still left unanswered. But my ability to assess grew better, I was more aware, I was better at practicing silence, I was better at working through emotions, I was better at weathering the ebbs & flows. And that is more of an achievement than I can ever hope for. As I continue my self awareness journey, the journey inward, I can only hope and plan for more growth in 2018. 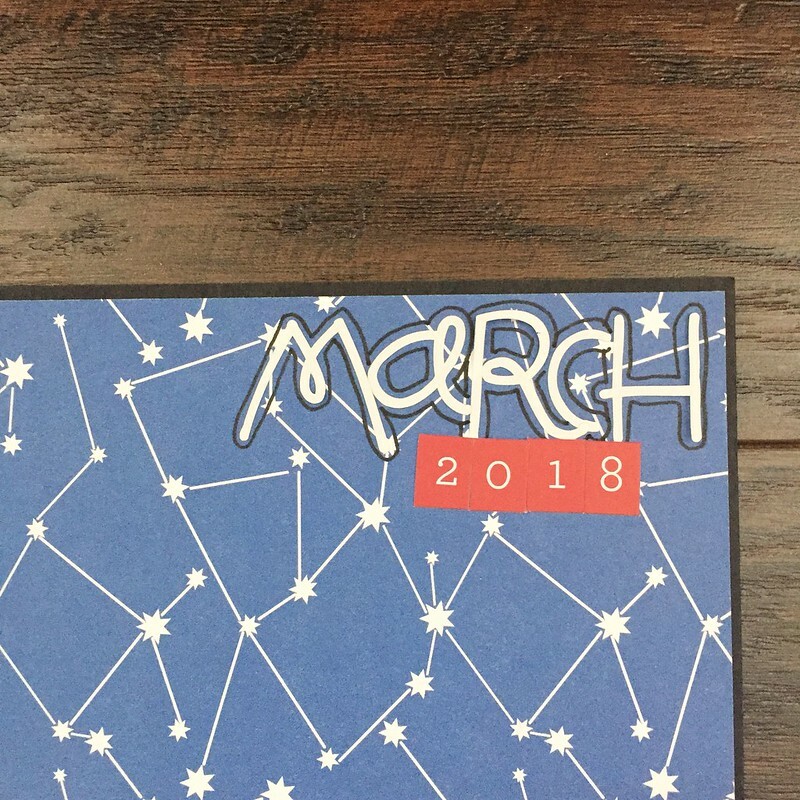 In addition to Unravel and choosing a word, I set up my new Bullet Journal for the year ahead. I was happy with my 2017 set up so I will continue the same style going forward, with a few adjustments as seen here. 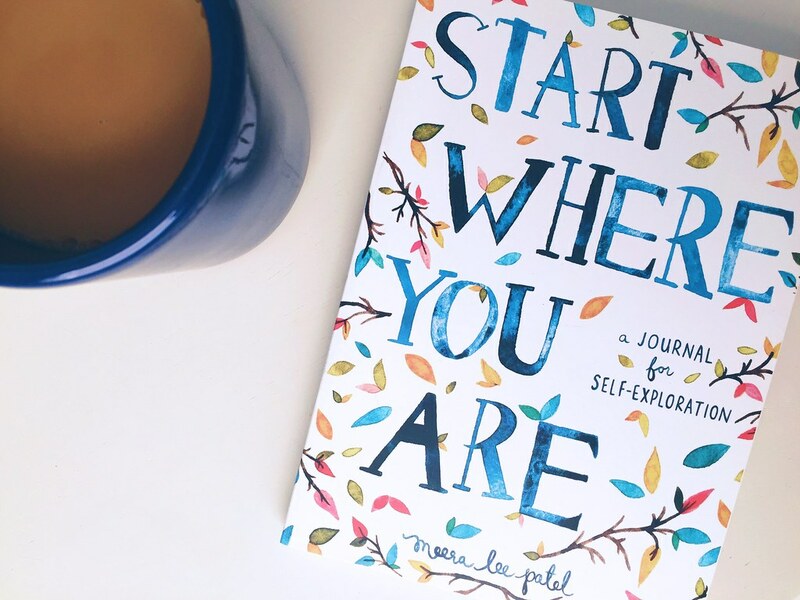 Also, I started to dive into this guided journal from Meera Lee Patel Start Where You Are. I’m a fan of her cards and artwork. I found a great pocket moon calendar for the year at Amazon here. As a Cancer, a moon child, I learned a lot more about how this influences my life this past year. I paid more attention to the phases & how it correlates to mood. I learned more about the cycles and their impact overall. Again, being aware. Looking forward to more growth in this aspect in 2018. I’ve been dabbling in the study of aromatherapy – I want to learn more about this from herbs to essential oils to the Ayurveda approach. I really would like to try to make my own soy candles. There’s also organization to be done. Some things are just still unfinished. Others need a refresh. I always find a little organization refresh in the studio seems to jump start the creating process as well. Love that connection. I have some professional goals as far as studying and taking a test for a certification I’ve been considering for a couple years. I would like to make more progress on a physical representation of my ancestry and see the results of the work I’ve put into that research. This takes quite a bit of time and I still haven’t figured out exactly how I am displaying or publishing what I’ve found. And finally, we are discussing the idea of pet ownership again, by maybe the end of the year. So something to look forward to. I feel like I’m off to a good start. Here’s to 2018!